The first concert the Magic Band played at Shepherds Bush Empire on Monday 7th April 2003. Organised and led by John 'Drumbo ' French (drums, vocals harmonica); the band consisted of Gary Lucas ( guitar); Denny Whalley ( guitar); Mark ' Rockette Morton ' Boston ( bass) and Richard Williams ( drums). All had played with Captain Beefheart ( aka Don Van Vliet ) at various times and their mission was to recreate songs from the Beefheart canon. The Magic Band Farewell Tour to which I attended with friend K.
last Monday 20th November 2017 at The Fleece, Bristol. Here's a thought. How many bands with great musicians after an interval of fourteen years still charge the same for their tickets ? Not many I venture. Arriving early I quickly grabbed the latest tour T shirt; still selling for a modest fifteen pounds. Pulling rabbits out of a hat indeed. Catch up with Photos. A coded life? The nights draw in and real racing returns. The majestic leaps; the noble presence; triumph and disaster lie side by side. Elation and despair. The Winter Kings return for our pleasure. 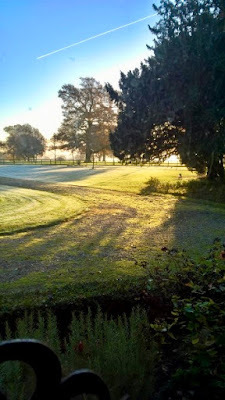 Frosty, crisp mornings, bring heart-warming country-side views. Here are three, two from darkest Essex, one from deepest Brockworth. Once a year, the River Thames is drained near Richmond for general maintenance . On October 16th, owing to unusual weather conditions , aided by Saharan dust, the sun appeared to turn pink- weird stuff! The above is a picture taken from inside the new, American style burger bar " Five Guys, " which has recently opened in Cheltenham.